Home > Your Questions > What Is The Typical Installation Rate For Scaffold Shrinkwrap? How many square metres of scaffold shrinkwrap can be installed per day? 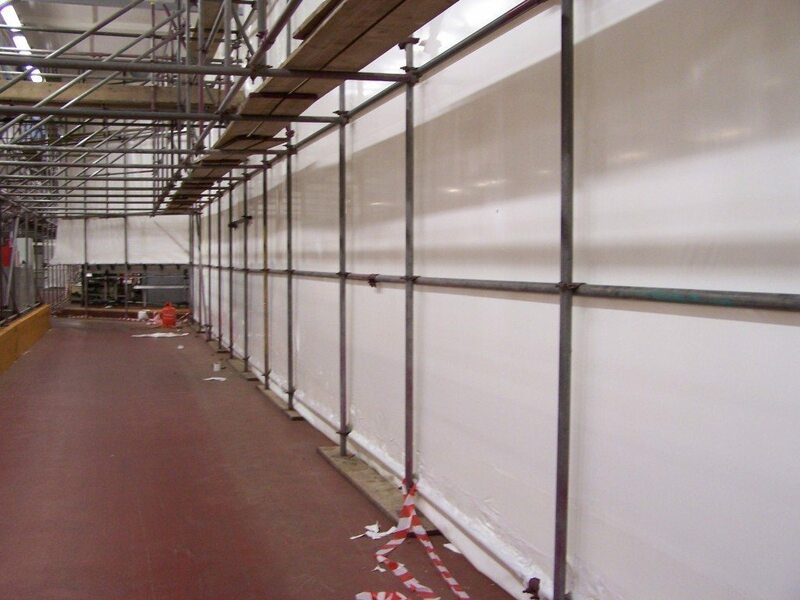 We generally advise that an area of 100 square metres per man per day is a realistic rate for the installation of shrinkwrap sheeting for scaffolding encapsulation & containment. However, the area of shrink wrap that can be installed in a day may be significantly more or less than 100m2 per day. This article explores some of the factors that affect the installation rate to help you judge how long the installation process might take for your project. Working on an indoor shrink wrap projects such as temporary factory partitions can enable daily rates in excess of 100 square metres per day. This is because, with no wind loadings to consider, sheeting can be hung to the full extent of it’s 15 metre drop before it is attached back to the scaffolding structure. This means less time consuming welding and joining of sheets. Of course, not every internal partition means high daily installation rates. There may be multiple pipe protrusions or roof beams protruding through the shrink wrap sheeting that requires the shrink wrap to be cut around beams and re-welded. The weather can have a big impact on the rate that shrink wrap sheeting can be fixed to scaffolding structures. 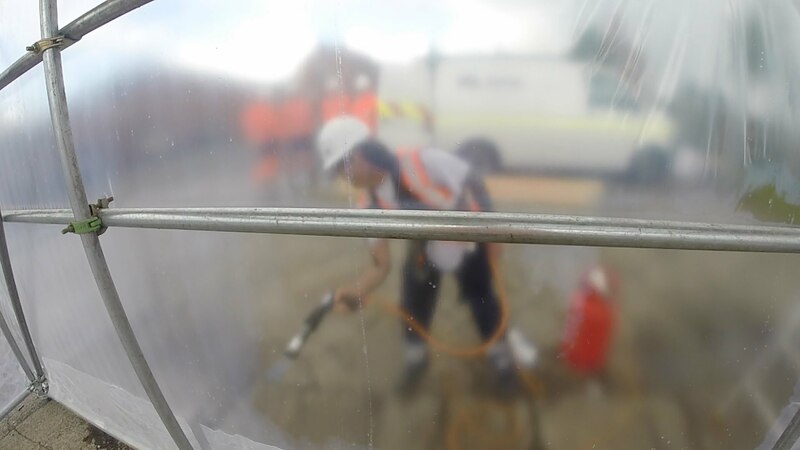 Although light rain is generally not a problem, creating welded joints between sheets can start to become difficult when the sheeting is very wet. Installing shrink wrap over temporary roofs should particularly be avoided in wet conditions. We generally advise that you do not start fixing sheeting to a temporary roof unless you can entirely finish (weld & shrink) that section. 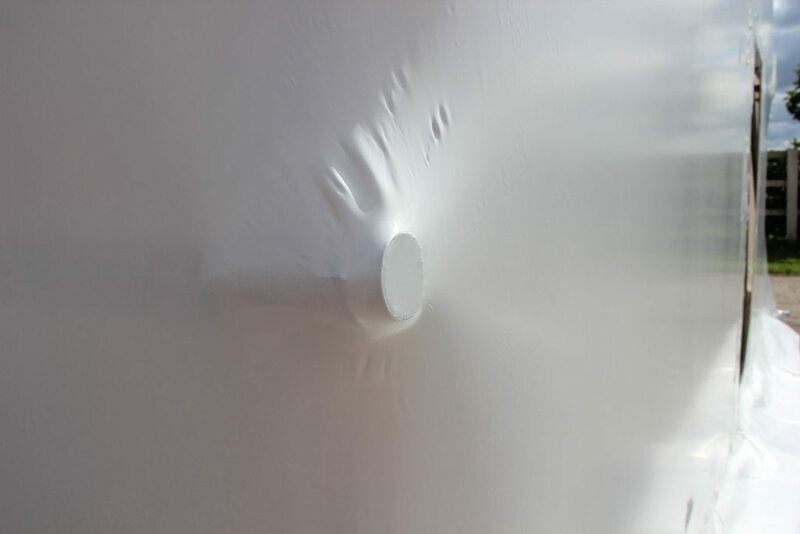 Windy conditions can slow up the installation rate of shrink wrap sheeting. Unrolling and attaching the sheeting is slower as it is only possible to work on smaller sections at a time. 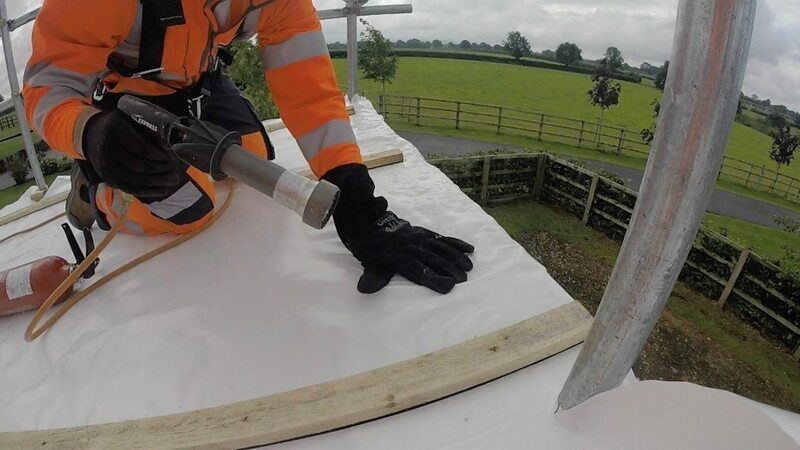 Shrinking sheeting in windy conditions is much slower as the installer must heat a much smaller area and wait for it to shrink before moving the heat gun over the next area. You can see the technique for shrinking scaffold wrap in this video. Side elevations will be much faster to encapsulate than roofs. It is also worth bearing in mind that some sites are just slower to work on. If it takes 30 minutes to return from the break area or get materials to the working area then productive working hours can be vastly reduced. For a case study where access was difficult click here. Temporary roofs may see daily shrink wrap installation rates less than 100 square metres per day. Main reasons for this is that unless the temporary roof is fully boarded, operatives must use harnesses and life lines which makes moving around the surface of the roof slower. It can also be more awkward to get the materials to the work area and installing a roof sheet involves extra processes such as fixing battens. Apart from having a huge impact on the appearance of your shrink wrap scaffold sheeting, a scaffolding with lots of protruding ledgers, transoms, handrails, boards etc will slow up the daily installation rate. It will be hard to get the sheeting straight and although cutting around protruding tubes is a relatively quick process, resealing and taping around tubes can be time consuming. Alternatively, a flush scaffolding with dedicated sheeting rails can make the daily installation rate much faster. For more information and advice on setting up a scaffold structure for shrink wrapping click here. The amount of shrink wrap sheeting that can be installed in a day has an affect on the price. For more information on shrink wrap pricing / costing factors click here.